Paulist Fr. John Geaney is based at the Paulist Center in Boston. Fr. Geaney leads the parish mission "Touching the Face of God." He previously served from 2010 to 2018 as rector of the Cathedral of St. Andrew in Grand Rapids, MI. During many of his years in Grand Rapids, Fr. Geaney also served as director of the Catholic Information Center. 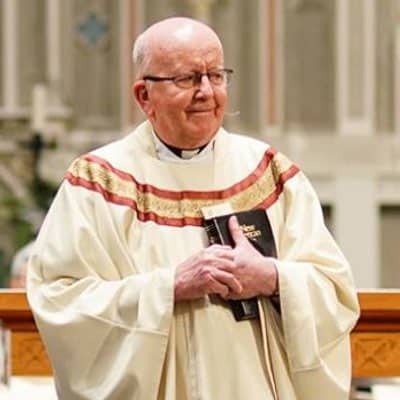 His long priesthood has also seen service at St. Paul the Apostle Catholic Community in Los Angeles; the University Catholic Center at UCLA; St. Paul's College in Washington, D.C.; Archdiocese of Boston; Intercommunity Telecommunications; Paulist Communications; Paulist Media Works; Catholic Relief Services; and St. Augustine Church in Memphis. In 1997, he served as executive producer of "Trappist," a television documentary. In April 2013, Pope Benedict XVI conferred the Pro Ecclesia et Pontifice Cross upon Fr. Geaney. A Massachusetts native, Fr. Geaney made his first promises to the Paulist community on September 8, 1958. He was ordained a priest on May 11, 1964. To reach Fr. Geaney, please call (616) 795-2974 or email FrJohnGeaney@paulist.org.